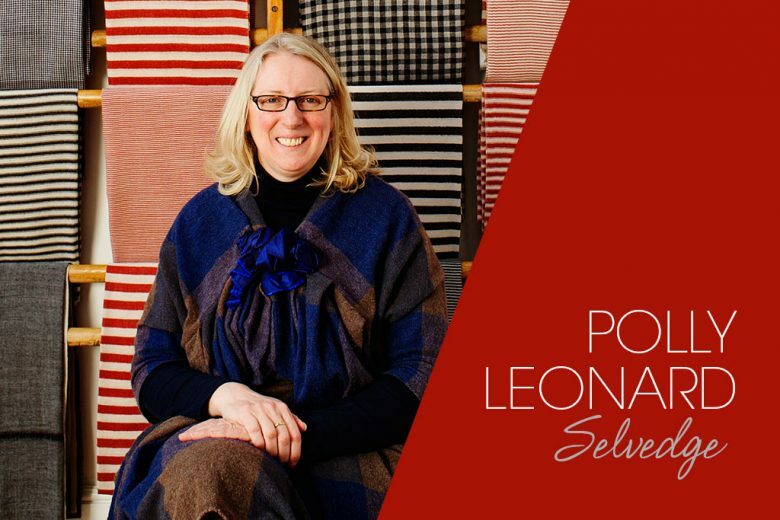 Polly Leonard is the Founder of Selvedge, a bi-monthly, independently made magazine. In every issue the magazine explores the history, future, politics and aesthetics of textiles with its own distinct voice. Since its launch in 2003, the Selvedge brand has flourished in to a spring-board for makers and artisans and a strong community of textile lovers, with workshops, fairs and its own bricks and mortar and online shop. After training as a textile artist, I taught textiles in schools for ten years. I had to go back to school teaching when my first child – Phoenix – was just six weeks old due to economic necessity. I worked full time for a year but found it very tough to combine the pressure of teaching with being a mother. I started thinking about other types of work I could do and thought about going in to magazines. I got a few commissions from a textile magazine – which I wrote while I was invigilating GCSE exams in the school – so that was how it all started. After I left teaching, I was a stay-at-home mum for a year. Much as I love my son, I found this incredibly boring. By this point, I’d started writing big articles for various textile magazines and also decided it was time to try for another child. I got offered a job editing a textile magazine, and although the timing was terrible in terms of my family plans, I just said yes to it; my first issue came out just before I gave birth to my daughter, Liberty. I edited the magazine from home, so would do my work with Liberty in a sling or lying in a crib that I would rock with my foot. Where did the idea for Selvedge come from? While I was working on the other magazine, I could see from the inside that there were too many amateur magazines out there that weren’t really giving textiles its professional face. I had a different vision for the future of the magazine I was editing than the publisher, so we parted company when Liberty was a year old and I decided it was time I did my own thing. Selvedge magazine was partly launched because there was a gap in the market, and partly because I needed a way of combining motherhood with my work in a more flexible, creative way. I think it’s partly down to personality type: some people have ideas but are too scared to implement them, others – like me – just naively go ahead with ideas without giving them much thought. If I had given Selvedge more thought, I probably wouldn’t have done it. I had no business plan and hadn’t thought about funding. But launching a business doesn’t have to be a big deal – you can launch something in an afternoon, you just need to start doing it. The first thing I did was to make an A4 piece of paper with details about me, my vision and the offer of a free copy of the first issue. I handed it out at a textile trade fair and managed to build up a database of 5,000 people to whom I sent a free copy of the first issue. From this I got enough subscribers for me to make the next issue, and things have grown from there – I guess you could call it early crowd funding. I now have over 45,000 subscribers based all over the world. Textiles, stories, the way textiles link with humanity and the way women use textiles to tell their stories. I’m really inspired by textile businesses like Dosa, run by Christina Kim in LA, Gudrun Sjödén and Marimekko. How was Selvedge evolved over the years? It all started with the magazine, but since then there has been a bookshop, an online shop of artisan products, a bricks and mortar shop and most recently our various events and creative collaborations. Magazines are not a great business model. In hindsight, I should have launched a quarterly publication. If you’re constantly making something, there’s very little time left to market and sell it. The timescale we work to is a challenge, as is the task of keeping each issue fresh. The next issue! There is always room for improvement. Anyone who appreciates and has a connection to textiles – be they a textile graduate or an amateur maker. In short, anyone with an interest in the clothes they wear or the textiles that surround them in their home. We have never spent money on advertising. Most of our activity is through word of mouth and more recently through social media. We also go to where people interested in textiles go. How do you balance Selvedge with family life? My family always comes first, with work fitting in around their needs. I think it’s interesting that my children understand what it means to work as they’re exposed to so much of what I do. I need the satisfaction of a job well done and always go the extra mile – again, I think it’s a personality trait. When I’m not looking after my children I’m working. To make a little bit more money so we can move the shop to a location that’s better suited to what we do. Although we have a worldwide subscriber base, our events are still only in the UK; I would like to hold physical events all over the world so that wherever people are, they can connect to Selvedge. Find out more about Selvedge on their website.